by Bill Dwight on Friday, February 24, 2012 at 12:26 PM | LEAVE A COMMENT! The dog ate my...err... report card! 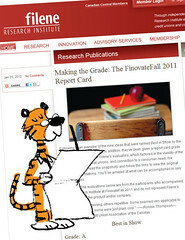 In the better-late-than-never category, I just stumbled upon the fact that we earned an “A” grade on the FinovateFall 2011 Report Card posted by the Filene Research Institute. Woot! The report card expresses the opinions of 23 credit union leaders who accompanied Filene to the financial technology innovation show last year in New York City where FamZoo picked up a Best in Show award. Since the report card doles out 3 A’s, 3 B’s, and 3 C’s to the nine Best in Show winners, the “A” grade represents a best-of-the-best nod from the credit union perspective. We’re very honored by the accolade. Nine ideas that were ranked Best in Show by the FinovateFall 2011 audience...have been given a report card grade based on the rankings of Filene’s evaluators, which factored in the viability of the idea, relevance to credit unions, and connection to a consumer need. Cool product. May be a play for credit unions to engage the next generation of members. Interested? For more information about our youth financial literacy and marketing solution for credit unions, see here.